More than 120 people attended our meeting with Local Elections candidates which was organised to help W4 residents and business owners decide on who to vote for at the ballot box on May 3. Chaired by Susannah Simons, the former BBC Radio, Channel 4 & Classic FM presenter, there were 11 panellists from the four main parties. They were Daniel Goldsmith, Green Party Chiswick Riverside; Francis Beddington, LibDems Chiswick Riverside; Guy de Boursac, LibDems Chiswick Riverside; Joanna Biddolph, Conservative Turnham Green; John Stroud-Turp, Labour Turnham Green; Leigh Edwards, LibDems Turnham Green; Nick FitzPatrick, Labour Chiswick Homefields; Ron Mushiso, Conservative Turnham Green; Ranjit Gill, Conservative Turnham Green; Sam Hearn, Conservative Chiswick Riverside; and Tom White, Labour Chiswick Riverside. Notably absent from the meeting was Ruth Mayorcas, Labour candidate for Turnham Green, who is the biggest cheerleader for CS9. Candidate Mayorcas has even questioned the existence of this Group on the basis that none of us know what Tfl’s revised scheme will look like. So, she argues, there’s no point in any of us having any meetings until we do. We have two issues with that position. Voters have a right to question their candidates so that they can make informed decisions on who they want to represent them. And Tfl doesn’t have a track record of putting Mark II cycle lane schemes out for consultation. So, back to the meeting then. After a lively 90-minute question and answer session with the candidates, the audience was asked to vote on three different scenarios. Here’s what transpired. Are you for or against CS9 in its current form? The motion against CS9 in its current form was carried by a significant majority. Only three people voted for the current scheme. This reflects the Tory position. Should Tfl improve CS9 design on the High Road to ensure cyclists, pedestrians and public transport receive demonstrable benefit and are not disadvantaged? The Nos carried the vote against this option, although close to 40 percent of the room agreed that they would like to see a scheme that benefited all parties. The latter reflects the LibDem and Labour positions. Would you prefer the scheme to be scrapped altogether? The majority of the audience said Yes, they’d prefer the scheme to be scrapped altogether, with some calling for the Cycle SuperHighway to be built along the A4 instead. CS9 – How will you vote? Where do they stand? Meeting chaired by Susannah Simons (BBC Radio, Channel 4, Classic FM) with panellists to be confirmed. Free admission to this event for residents, traders and registered voters who live within the W4 postcode. Cancel everything and do come along! And please forward this link to everyone you know who feels strongly about this issue. Local elections are fought on local issues and we are told by prospective candidates that CS9 is the number one issue on the doorsteps of W4. It should be a cross-party issue, but CS9 has become politicised, so we must deal with reality. The three main parties naturally agree that roads should be safer for all users and that we must all become healthier and more active. But their position on CS9 differs substantially. Conservatives: strongly against it, say it disadvantages pedestrians, should be on the A4, and needs a radical re-design or should even be shelved. It’s one of their key campaign issues. Labour: approve the scheme with a few changes. Not campaigning on it at all because they know it is unpopular and will lose them votes in W4. They are waiting for the results of the May 3 election when Labour is expected to get an overall majority again and they will then vote a new scheme through. Lib Dems: for safe cycling but against this scheme, not least because it will slow down bus journeys and adds to congestion. Believe it would be better to have a one-way cycle track on either side of the CHR rather than a bi-directional lane on the south side. It’s one of their key campaign issues. Labour candidates are not campaigning on CS9 at all because they support it and know it’s a vote loser. Indeed, one has told us: “I think a few people feel very strongly about it but most are indifferent”. Write letters for publication to the local and national newspapers when you see articles about cycling issues and cycle superhighways in particular. Ensure any friends living locally know about CS9 and encourage them to lobby too – if everyone contacts five people, who then contact five people each and each of those contact five other people, that’s the way we will grow support. If there are any meetings about CS9 during the local election campaign, please make every effort to attend. Please ensure you vote on May 3 – and consider voting tactically. According to our current local councillors, lobbying works. Together we can mitigate the effects of the proposed CS9 route in Chiswick if we all make a stand and start shaking things up. So the local newspaper, The Chiswick Herald, has published the results of its recent poll on Cycle SuperHighway CS9. An overwhelming 73 percent of respondents voted against CS9 in its current form. That’s 6,535 people. Fourteen percent (1,296) said they were in agreement with the scheme and a further 13percent (1,151) said they’d support a cycle lane if the current plans were reworked. No sooner had a Tweet about the poll hit the Twittersphere, we were called out by a pro-cyclist who said a newspaper poll was not the same as Tfl’s consultation which received fewer – 5,388 – direct responses, but of which 59 percent were in favour. 65 percent of respondents to that consultation apparently identified as cyclists. Hang on a minute. What percentage of the population cycles: 5 percent; 10 percent max? You’d expect cyclists to want to comment, but it surely makes a joke of the idea that the 59 percent who “support” CS9 are representative of the general local community. Of the 27 local groups lucky enough to be contacted and consulted by Tfl about its plans, 24 of them opposed or strongly opposed Cs9 in its current form. That fact speaks for itself. 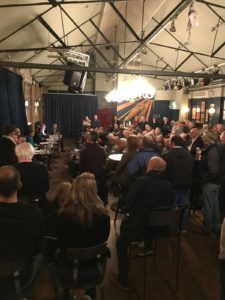 The added hindrance being that a response from a residents’ group, which potentially represents hundreds of people, is counted as a single vote. Tfl told one W4 resident that it wrote to 70,000 people living and working close to the proposed Cs9 route as part of its consultation. Thousands of us however, many of this group included, received no leaflet, no email, zero information in fact about the six week consultation period prior to it closing. These are fundamental flaws. As a result, the London Forum of Amenity & Civic Societies has said that not enough residents were notified by Tfl and that the local council’s publicity was limited. And the Mayor of London has since acknowledged that local concerns regards the impact of the current scheme on CHR will be addressed. The good news is that, the Local Elections are on their way, which gives people with a vote within our Borough a chance to press their candidates for a locally sensitive design which works for everyone – pedestrians, bus users, cyclists, residents and traders alike. There’s no doubting that plans to build a bi-directional Cycle Superhighway along Chiswick High Road have divided Londoners. Not just the local community that CS9 will directly affect necessarily, but Londoners who are pro-cycling whatever the impact locally, versus those who are concerned about its impact on the local community where they live and work. Unfortunately, the current debate over CS9 which is pitting the pro-cycle lobby against Hammersmith and Chiswick traders and residents, comes with a catalogue of endless and unpleasant bullying, nastiness and damaging misrepresentations which has escalated in recent days. Local traders along Chiswick High Road who have made plain their hopes to redesign the scheme have been labelled “murderers” in a public meeting, called “posh cunts” in the street and one had a Redesign CS9 poster torn from the wall of his shop. Another individual has been spat upon for having the temerity to his vocalise how CS9 will adversely affect his particular community. More recent, pro-cyclists have take to Twitter to attack the local bakery and café Outsider Tart which opposes CS9 in its current form, calling for a boycott of the business and maligning the business by incorrectly alleging that it has “food hygiene” problems, a statement which is untrue. Another individual has since used a mock-up of a Mobikes hub outside their shop to share a video via a different online forum which shows a missile blowing up the pavement and the business. Naysayers have rushed to claim that this video has “nothing to do with CS9”. The creator however has said it is associated with CS9, so we are not guilty of conflating (as charged by pro-cyclists). 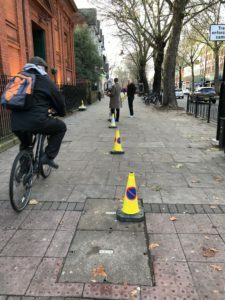 As a business, Outsider Tart has been subjected to escalating online and offline abuse, due to its opposition to CS9 and has been persistently branded “anti-cycling”. To suggest that this video of an air-borne rocket bombing a local shop has nothing to do with its opposition to CS9 is disingenuous and naïve in the extreme. Message to the London Cycling Campaign, from David Lesniak, Outsider Tart: Please could you speak to the direct and violent language cyclists use towards others? Without doing so you imply theirs’ is behaviour beyond reproach. My partner and I have been called murderers. Our business has been threatened. And when neighbours have taken cyclists to task for riding on the pavement, they have been called “posh cunts” which, I believe, is technically anti-social behaviour. One pro CS9 supporter who is hiding behind a “parody” account on Twitter has “joked” that the congregation of Our Lady Grace should “be gassed” by cab fumes. If the religious building in question had been a Synagogue, this would have been denounced and classed as a Hate Crime. The unpleasant, bullying nastiness is relentless, a fast and furious flow of repetitive messages and sneers intended to wear recipients down. Most of it is perpetrated by men who cycle, but often live elsewhere in London and not in the affected postcodes. Their strategy is to twist arguments to try and make local people look ill-informed. For example, one anti CS9 commentator has repeatedly been accused of saying “cycle lanes cause pollution”. What she has actually said is that “TfL’s modelling shows CS9 will increase congestion and congestion causes pollution”. Another tactic is to retweet the incorrect statement, often adding further unpleasant comments. This behaviour is designed to humiliate or draw out an angry response – that they will then criticise. Some local election candidates have remained silent, while others like Darren Moore and Ruth Mayorcas have also chosen to attack local businesses and Redesigners, which we find curious given this is a community, rather than a political issue. In doing so however, they have successfully turned CS9 into an election issue. All of this behaviour is beyond the pale, elements of it representing of the kind of online hate speech that the Mayor of London says he is seeking to stop. In his #endthehate campaign, the Mayor says it’s on all of us to tackle this problem. Social media companies, governments, politicians, the media and the public alike. He says let’s work together to end this hate. It’s time to act on hate speech. Threatening lives, businesses and communities with air-borne rockets however isn’t the path forward. Those who oppose CS9 in its current form have genuine and growing concerns about being able to express their views freely without being publicly vilified and accused of being anti-cycling. The fact that the owners of Outsider Tart have gone public, and have been subject to such hate and abuse, has put many other people off going public too. They simply feel unsafe in the online and offline world. Actively tell their representatives, campaigners and relevant local election candidates to cease any damaging, aggressive and irresponsible behaviour towards traders and local people in Chiswick and Hammersmith who oppose CS9 in its current form. Join together and sign an open letter to encourage a better quality of civic discourse, but eliminate hate speech, hate crime and threats of violence. It appears that the Mayor of London agrees with requests to RedesignCS9 with regards to plans to take away pavement space. The residents and traders of Hammersmith and Chiswick have been portrayed by cyclists as being anti-cycling and NIMBYs. This is misinformation. We are not. Hammersmith and Chiswick would benefit from improved cycling infrastructure, but that should mean working with residents and businesses locally to find a scheme that works for everyone. Many traders and residents were not consulted by Tfl or the London Borough of Hounslow. Many of us did not receive letters, leaflets or emails and were unaware of Tfl’s consultation. That is why so many of us signed the various petitions objecting to CS9 in its current form. It is evident that this consultation has been influenced by cyclists and people who do not live in the areas concerned. Many of these people have openly stated on social forums that they have no regard for the interests or needs of local people, businesses, pedestrians or public transport users. To rectify Tfl’s lack of consultation, we call upon them and the Mayor of London to meet with residents and traders as a matter of urgency to find a better solution that works for everyone in our community – and not just for a small minority. The long read. When you have the time. When streets aren’t made for walking….. 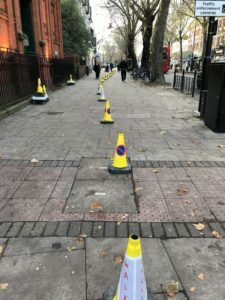 The CS9 proposal in its current form does nothing to pro-actively design or resolve walking issues and thereby does nothing to promote healthy activity on the footpath, a direct contradiction to the Healthy Streets directive. A study from the International Journal of Hygiene and International Health proves walking is an extremely healthy life choice. In fact, many think walking is healthier than cycling for cardiovascular health. Anyone with a Fitbit or other activity tracker will tell you more calories are burned walking vs cycling. Regardless of what you may believe, reduction of pavement width is not urban design. It is a consequence of installing one amenity at the expense of another. And with pavements reduced, less people will walk and less will socialise per the evidence found in the study above. This does not a community make. More Chiswick based residents have been getting in touch with their concerns. Many feel that CS9 prioritises cyclists over all residents who will suffer from increased pollution because there will be long queues of stopping and starting traffic. Journeys through Chiswick will take at least 10 minutes longer. Floating bus islands have been shown to be dangerous; cars will cut across the cycle lane at right angles over 30 points; and the width of the two way cycle lane means all pedestrians will face bikes travelling up to 25mph just inches away. Will it be Hounslow or Tfl who assumes liability when a child is injured or killed? Safe cycling for the number that go along the High Road is a great idea but not at the expense of smooth running public transport which is used by many more. This scheme prioritises male middle class commuters over the minorities who depend on public transport.